Using your own computer, this extension/add-on will do all of the clicking for you. No bots or 3rd parties involved. Get ready to sit back, relax and avoid the stress of having to click each link yourself. LikeItAll will do it all for you. You can save yourself time and stress while increasing likes to your posts. Watch the video below to quickly get started using LikeItAll. LikeItAll has an Auto-mode which will find links and automatically like them. Open up Facebook or Telegram and set LikeItAll to Auto-mode. watch as it highlights all the links it finds in yellow. It will then begin liking those posts automatically. Each time Likeitall processes a link it will turn it green. You can watch LikeItAll live while it works or let it work for you in the background. Who doesn't want to beat the algorithm 😂. For all those hustlers out there working hard to do just that you need to look no further. LikeItAll is seriously what you need! This has been life changing for my hustle and in the best way possible. No more endless hours liking photos. I can spend my time working on things that really help grow my business. LikeItAll is simple and easy to use while you can work on other tasks at the same time. It's a win win for everyone. LikeItAll also has a Semi-mode which is easy to use. Use Semi-mode anytime you want to control which posts you wish to like. Semi-mode works by completing multiple steps for you to save you time. When running in semi-mode, click on each link manually and LikeItAll will automatically open it up in a new tab and like it. Next it closes the new tab for you so you can move on to the next link. Semi-mode will save you on average 3 clicks per link. With all the algorithm changes and being a busy mom I was searching for something fast and easy to help grow my followers. Getting my engagement up was key so I joined some FB like groups but it was so time consuming to spend hours liking 50-100 photos. Until I found LikeItAll. Being a busy mom, I am always multitasking and when I turn on LikeItAll, it does the work for me so I can play with my toddler, shower or even just simply enjoy my coffee with 2 hands vs 1 while I double tap away. LikeItAll is seriously a life saver! I can just push Auto-mode and watch it work it's magic while I sit back and drink my morning cup of coffee. Game changer!! Using LikeItAll has been a game changer for my business. It helps keep me engaged with my community while freeing me up to be able to multi-task. I would highly recommend it for anyone wanting to UP this IG game! Auto-mode and Semi-mode work in Telegram the same as it does for Facebook. Open up a tab to Telegram, select a group, and turn on LikeItAll. It will use the same green highlights for links you have already liked. In Auto-mode LikeItAll will also highlight any links it detects in yellow and begin processing the links and turning them green. Make sure you are using Chrome or Firefox to access your Telegram account at https://web.telegram.org for LikeItAll to work. 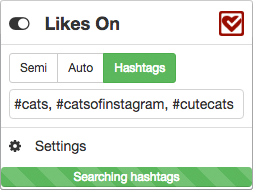 Hashtags-mode allows you to select a bunch of hashtags that LikeItAll will search find posts to like for you. This allows you to stay engaged through the day without any manual work. Hashtags-mode is simple, first you type in a few hashtags to target. 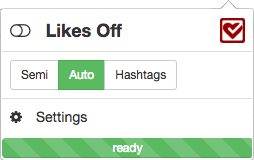 Next LikeItAll will do a quick search for posts that contain those hashtags and select a few. Then, LikeItAll will like them for you and take a short break before repeating the process. There is also a review page where you can do a final examination of the posts that have been liked. What an AMAZING extension! Saves so much time, I have recommended this to lots of satisfied users. It is so user friendly, I cannot fault the developer, I have contacted him a few times and I always get an almost immediate response, each time he has talked me through any issues until all was resolved, definitely recommend !! What would have taken me HOURS to do, this app has done it! 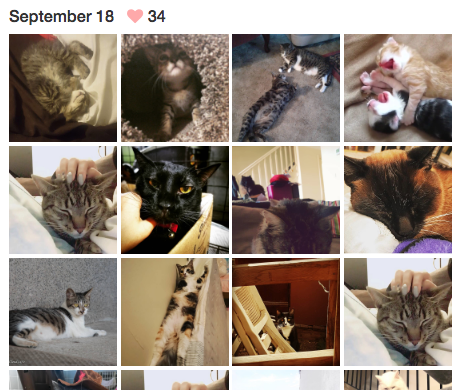 This is literally a game changer for anyone who is growing their Instagram! Such a great price too! I highly suggest using this extension..it will save you tons of time! App is a lifesaver! Customer service has been exceptional. I've written with 2 small issues and have gotten immediate responses with prompt replies on how to navigate the issue at hand. No need to give LikeItAll your Facebook or Telegram passwords (keep your passwords private). Buy a licence for LikeItAll using the button below. We will send you an email with your key-code. The email will also have a link to install the LikeItAll browser extension. Log-in using your email address and your key-code and you're ready to go.